Kalstar Aviation (Serpong, Indonesia) Embraer ERJ 190-200LR (ERJ 195) PK-KDC (msn 19000057) while operating flight KD 678 from Denpasar (Bali) to Kupang, Indonesia, with 120 passengers and five crew members on board, overran runway 07 last night (December 21) while landing at Kupang. No injuries were reported according to the Jakarta Globe. Copyright Photo: Michael B. Ing/AirlinersGallery.com. Kalstar Aviation Embraer ERJ 190-200LR (ERJ 195) PK-KDC (msn 19000057) with special “Adventure Borneo” markings arrives at Jakarta (CGK) before the incident. 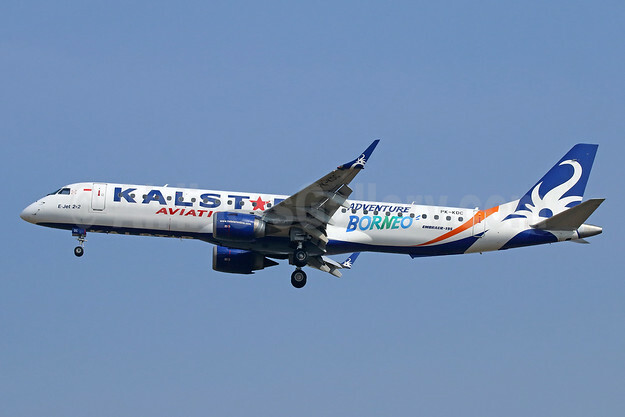 This entry was posted in Kalstar Aviation and tagged 19000057, Accident, E195, Embraer, Embraer 195, Embraer ERJ 195, ERJ 190-200LR, ERJ 195, flight KD678, Kalstar Aviation, overran runway, PK-KDC on December 22, 2015 by Bruce Drum. Flybe (Exeter)has announced it has signed a contract with Helvetic Airways (Zurich), to provide the Swiss airline with a 118-seat Embraer 195 jet aircraft with flight deck and cabin crew, operating under Flybe’s Airline Operating Certificate (AOC) for a period of two months. Helvetic Airlines operates flights frequented by both business and leisure customers to destinations in Europe and Northern Africa. Its arrangement with Flybe will run from July 1 through to August 31, 2014. The aircraft will operate three key routes from Zurich to Ohrid, Skopje (Macedonia) and Prishtina (Kosovo). In other news, the company’s efforts to turn around the company are working. The company posted an £8 million ($13.4 million) net profit for its full fiscal year. Copyright Photo: Michael Kelly/AirlinersGallery.com. Embraer ERJ 190-200LR (ERJ 195) G-FBEB (msn 19000057) lands at Dublin. This entry was posted in Flybe, Helvetic Airways and tagged 19000057, DUB, Dublin, Embraer, Embraer 195, Embraer ERJ 190, Embraer ERJ 190-200, Embraer ERJ 190-200LR, Embraer ERJ 195, ERJ 190, ERJ 190-200LR, ERJ 195, Flybe, G-FBEB, Helvetic Airways, Zurich on June 12, 2014 by Bruce Drum. Flybe (Exeter) plans to cut another 500 jobs after it posted its first half-year profit in two years. Flybe announces a significantly improved financial performance under its new management team. In addition, a new phase of efficiency improvements announced today will secure a strong base for future growth. * Includes Flybe’s joint venture, Flybe Finland. ** Adjusted profit/(loss) before tax, restructuring and surplus capacity costs and revaluation on USD aircraft loans defined as profit/(loss) before tax, restructuring and surplus capacity costs of £4.1m (2012/13: £nil) and revaluation gains on USD aircraft loans of £5.7m (2012/13: £0.7m). Surplus capacity costs represent the costs incurred in H1 2013/14 relating to capacity that is considered by management to be surplus as a result of the restructuring decisions. *** Adjusted profit/(loss) before tax and restructuring defined as profit/(loss) before tax and restructuring costs of £3.3m (2012/13: £nil). + H1 2012/13 has been restated for the impact of adopting the revised requirements of IAS 19 Employee Benefits as detailed further in Note 2 to the condensed financial statements. The replacement of the interest cost and expected return on plan assets with a new interest charge on the net defined benefit liability led to a £0.3m increase in the reported loss for that period. 1. First two phases of the Turnaround Plan on track to deliver savings of £40m this year and £45m in 2014/15. 2. A 20.4% increase to £477.3m (H1 2012/13: £396.3m) in revenue under management (including Flybe Finland, the joint venture with Finnair) largely driven by increased contract flying activity in Finland. 3. A 3.0% increase in group revenue to £351.1m. 4. A £13.8m profit before tax (H1 2012/13: loss of £1.6m). – 6.2 million scheduled seats flown, in line with last year. – 5.6% increase in passengers to 4.3 million. – 3.6ppts increase in load factor to 68.6%. – 0.9% increase in passenger revenue per scheduled seat to £50.35 (H1 2012/13: £49.92). – 1.3% increase in total revenues to £328.2m. – 1.3% decrease in costs per seat to £51.30. On a constant currency and fuel price basis, costs per seat decreased by 3.1%. – 4.7% increase in UK regional sector share for the Flybe brand to 55.1%. – 26.4% of Flybe’s revenue under management (H1 2013/14: £126.2m; H1 2012/13: £55.5m). – 84.6% increase to 2.4 million in total seats flown, of which white label flying totalled 2.0 million (H1 2012/13: 0.8 million). Flybe aims to become the best local airline in Europe delivering unrivalled regional connectivity. A regional branded airline giving a nimble and customer-friendly, scheduled service for both business and families. This brings people together within a country and connects people in the regions to international carriers at metropolitan airports. A regional white label model where Flybe will become the leading regional provider for mainstream European airlines. The already announced Phase 1 and 2 cost savings are being successfully implemented. Major management and organizational change: new Chairman and Chief Executive Officer have been appointed. Senior executive appointments well advanced, including a new Chief Commercial Officer already in place. Flybe’s operations have been reorganized into a single management structure. 1. Optimise configuration: rationalise route network, review fleet mix, remove surplus capacity and improve aircraft and crew utilisation. 2. Reduce costs further: all aspects of the business are being reviewed to drive further savings. 3. Improve commercialisation: optimise pricing and revenue management, refocus network development, strengthen route management, step change marketing impact and develop trading partnerships. This will deliver further benefit of £7m this year and £26m next year with around 500 proposed redundancies and estimated one-off and surplus capacity costs of £14m this year plus a further £27m in 2014/15. Finnair JV is now profitable; further improvements are being targeted by enhancing operational delivery, reducing scheduled risk flying losses and embedding ‘lean manufacturing’ techniques. Update: According to Reuters, majority shareholder Rosedale Aviation Holdings has sold its entire 48.1 percent stake in the airline to institutional investors. Copyright Photo: Antony J. Best/AirlinersGallery.com. Embraer ERJ 190-200LR (ERJ 195) G-FBEB (msn 19000057) lands at Southampton. This entry was posted in Flybe, Flybe Finland, Flybe Nordic and tagged 19000057, British European, British European 2nd, Embraer, Embraer 190, Embraer 195, Embraer ERJ 190, Embraer ERJ 190200, ERJ 190, ERJ 190200, ERJ 190200LR, ERJ 195, Flybe, flybe.com, GFBEB, SOU, Southampton on November 11, 2013 by Bruce Drum. Flybe (flybe.com) Embraer ERJ 190-200LR (ERJ 195) G-FBEB (msn 19000057) SZG (Arnd Wolf), originally uploaded by Airliners Gallery. 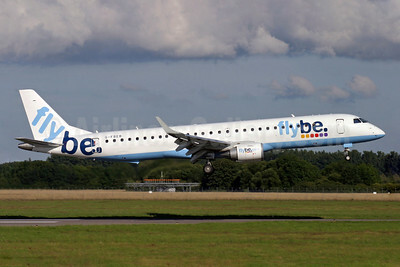 Flybe (flybe.com) (Exeter) in the meantime has moved closer to the Air France-KLM Group. The new code-share agreement (effective at the end of October) with AF will encourage passengers to bypass the Heathrow Airport hub and connect instead at the Paris (CDG) hub. Copyright Photo: Arnd Wolf. A nice winter study (in July) of Flybe’s Embraer ERJ 190-200LR (ERJ 195) G-FBEB (msn 19000057) at Salzburg. This entry was posted in Air France, Flybe and tagged 19000057, Air France, Arnd Wolf, Embraer, Embraer ERJ 190, Embraer ERJ 195, ERJ 190, ERJ 190-200LR, ERJ 195, Flybe, G-FBEB, Salzburg, SZG on July 14, 2010 by Bruce Drum. Copyright Photo: Arnd Wolf. Please click on photo for full view, information and other photos. 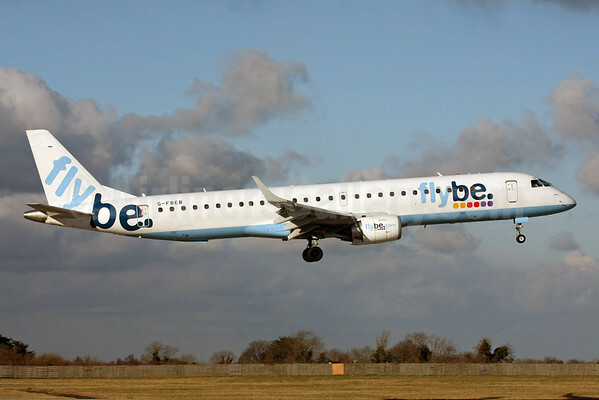 Flybe (Flybe.com) (Exeter) is the first airline from the United Kingdom to be able to fly in the new ash cloud standards approved by the CAA. Copyright Photo: Flybe’s Embraer ERJ 190-200LR (ERJ 195) G-FBEB (msn 19000057) taxies at a snow-covered Salzburg. This entry was posted in Flybe and tagged 19000057, Arnd Wolf, Embraer, Embraer 190, Embraer 195, ERJ 190, ERJ 190-200LR, ERJ 195, Flybe, G-FBEB, Salzburg, SZG on May 20, 2010 by Bruce Drum. Copyright Photo: Antony J. Best. Please click on photo for more photos. Flybe (Exeter) has now signaled it is interested in possibly bidding for bmi and the valuable London Heathrow slots. This entry was posted in bmi, Flybe and tagged 19000057, Airliners, Airlines, Antony J. Best, bmi, Embraer, ERJ 190-200LR, ERJ 195, Flybe, G-FBEB, SOU, Southampton on September 28, 2009 by Bruce Drum.